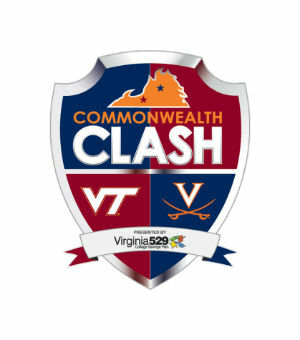 The longstanding rivalry between UVA and Virginia Tech is getting a new name — the Commonwealth Clash presented by Virginia529. Building on a tradition started when the two schools first competed against each other in a football game in 1895, the Commonwealth Clash is a head-to-head, points-based competition between the athletic teams of the Hoos and Hokies. The competition will include the 21 sports in which the two schools compete against each other, plus one fan-decided point. At the end of each school year, the institution with the most points will be crowned the champion of the Commonwealth Clash. The schools’ academic reputations, along with the loyalty of their alumni, drew Virginia529 College Savings Plan (Virginia529) to the competition. The state agency, which worked with the two schools to develop the Commonwealth Clash, has been helping families save for their higher education needs 1996. Fans can learn about the point system, get news on upcoming games and follow the teams’ standings atTheCommonwealthClash.com. The newly-created website also offers exclusive opportunities such as live chats with head coaches and the Tuition Toss, where contestants have a shot to win $52,900. The first rivalry event is set for Sept. 12 in Charlottesville when the men’s soccer teams from both schools meet at Klöckner Stadium. A complete schedule and game previews will be linked at TheCommonwealthClash.com. Virginia football coach Mike London will hold a live chat on the Commonwealth Clash’s official website Tuesday, Aug. 26 at 6 p.m. In order to register and view Coach London’s video chat go to www.thecommonwealthclash.com and click on the FanZone to register your questions and watch the Chat live.